Da Capo Press, 9780306821745, 362pp. 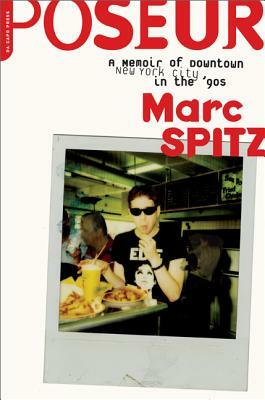 Marc Spitz assumed that if he lived like his literary and rock 'n' roll heroes, he would become a great artist, too. He conveniently overlooked the fact that many of them died young, broke, and miserable. In his candid, wistful, touching, and hilarious memoir, Poseur, the music journalist, playwright, author, and blogger recounts his misspent years as a suburban kid searching for authenticity, dangerous fun, and druggy, downtown glory: first during New York's last era of risk and edge, the pre-gentrification '90s, and finally as a flamboyant and notorious rock writer, partying and posing during the music industry's heady, decadent last gasp. Part profane, confidential tell-all and part sweetly frank coming-of-age tale, this dirty, witty memoir finds Spitz careening through the scene, meeting and sometimes clashing with cultural icons like Courtney Love, Jeff Buckley, Rivers Cuomo of Weezer, Chloe Sevigny, Kim Deal, The Dandy Warhols, Guns N' Roses, Ryan Adams, Paul Rudd, Coldplay, Pavement, Peter Dinklage, Julie Bowen, The Strokes, Trent Reznor, Chuck Klosterman, Interpol, and Franz Ferdinand, as well as meeting heroes like Allen Ginsberg, Shirley Clarke, Joe Strummer, and Morrissey. Along the way he finds literary guru Gordon Lish is a long-lost relative, and erstwhile pal and sensation JT LeRoy is an even bigger poseur. Spitz refuses to give up the romantic ghost until a post-9/11 breakdown and an improbable new love (fellow music writer Lizzy Goodman) finally help him strike the hardest pose of all: his true self. Marc Spitz has written and produced numerous novels, plays, and biographies, including We Got the Neutron Bomb: The Untold Story of LA Punk (with Brendan Mullen), How Soon Is Never: A Novel, Bowie: A Biography, and Jagger: Rebel, Rock Star, Rambler, Rogue. His writing on rock 'n' roll and popular culture has appeared in Spin, Rolling Stone, Maxim, Uncut, Nylon, Vanity Fair, New York Magazine, and the New York Times. He blogs at marcspitz.com. Spitz lives in New York City.